Nadezhda Savchenko, a Ukrainian pilot detained in Moscow over the deaths of Russian reporters, is quitting her hunger strike after 83 days. She has been demanding release from detention and Ukrainian President Poroshenko has sent a request to the Kremlin. Savchenko has had to break the hunger strike as her health seriously deteriorated, her lawyer Mark Feygin said on Friday. One day earlier, Savchenko agreed to consume chicken soup over health concerns, but said this was not the end of her protest action. By Friday, this however seemed to change. “You cannot quit a hunger strike in one moment, it’s a complicated and painful process,” Fedotov pointed out adding that Savchenko had no complaints against prison administration or doctors. The Ukrainian pilot started the hunger strike on December 13, demanding to change her pre-trial conditions from detention to house arrest. Savchenko was detained last July and charged with complicity in the death of two Russian journalists near Lugansk, eastern Ukraine, and with illegally crossing the border. According to the prosecutors, she was a gunner on an Aidar battalion helicopter and reported the location of Russian journalists Igor Kornelyuk and Anton Voloshin to the government troops, which then shelled the area outside Lugansk. The attack resulted in the deaths of the journalists and civilians. After that Savchenko allegedly illegally crossed the border into Russia. She does not accept the charges saying she helped to take out the wounded from the field during the attack. 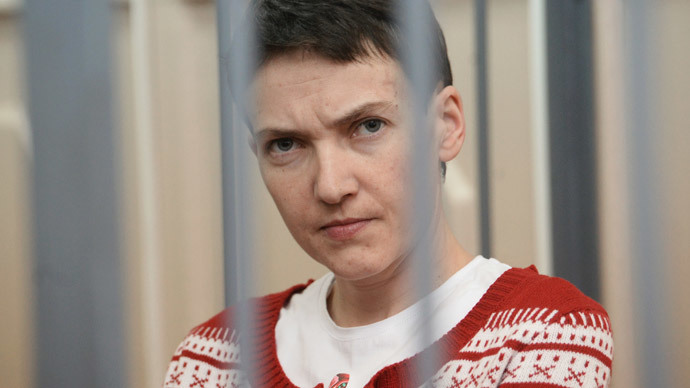 On February 10, a Moscow court extended Savchenko’s detention until May, 13. The Ukrainian President Petro Poroshenko said Wednesday that he sent a letter to Vladimir Putin with a request to release the pilot. On Friday a response signed by the Russian president was sent to Kiev but its details have not yet been revealed. The Russian presidential press secretary Dmitry Peskov noted it that it was very difficult to comment as Savchenko faces a trial and the investigation is still in progress. The Russian Foreign Ministry qualified the request as an attempt to exert pressure on the court. The officials described the situation of “a UN structure publicly call[ing] on a UN member state to break the principle of rule of law and try to exert influence on a trial” as “unacceptable”.